For the next few blogs we're looking at Florida. There's all kinds of interesting stuff happening there. They've just agreed to save a big chunk of land that was being used for sugar production. Now the Everglades will be better protected. 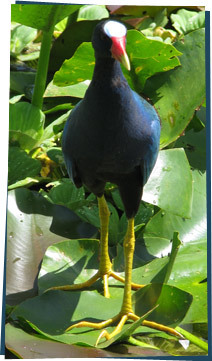 The Everglades are a giant marshy river that's home to fantastic alligators and birds like this awesome Purple Gallinule.